Gone are the days when shower curtains were an afterthought and of cheap variety. But nowadays, they have become an integral element of interior design – they do a fabulous job when it comes to defining your personal space. 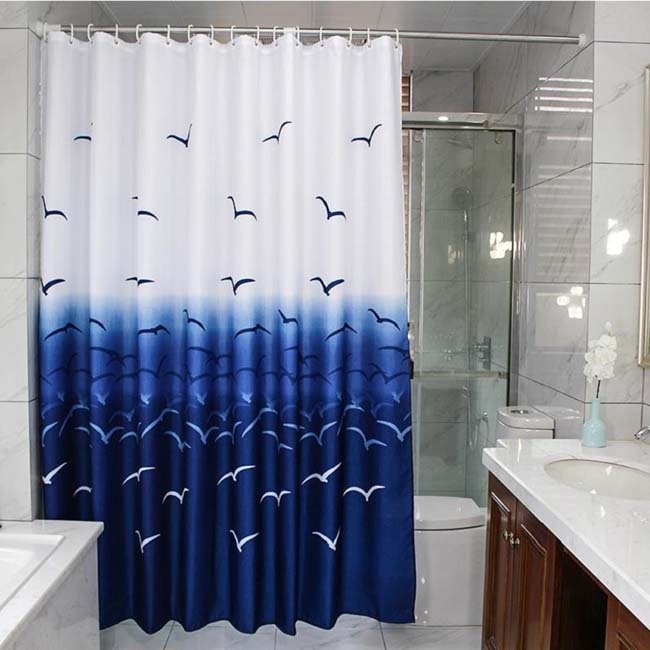 Choosing the right shower curtain that matches with the overall character of the bathroom is necessary for aesthetic purposes, but they protect floors against water damage and avert slipping hazards. What size is a standard shower curtain? What happens when your requirements don’t meet normal shower curtain sizes? Measuring shower curtain width! Take note carefully! Measuring shower curtain height! Have a steady hand while doing so! What is shower stall curtain size? Have you ever bathed in a shower that has a curtain that is extremely short or too narrow? It is a frustrating experience, as water leaks all over the bathroom, creating a messy situation. Before you purchase a new shower curtain, you need to take measurements to guarantee the perfect fit. The curtain needs to be sufficiently long so it hangs below the edge of the tub – this way water won’t spill onto the floor. You should also ensure the curtain can’t drag or pool on the floor – moisture accumulates, which facilitates growth of problems like mold and mildew. Eventually the flooring gets damaged and degraded, so you have to shell out exorbitant amounts for repairs in the long-term. It is advisable to opt for curtains that hang about 2-3 inches above the floor. At times, a standard shower curtain won’t fit in the bathroom. For instance, extra long shower curtains are required for tubs that are sized larger than normal ones. A large walk-in shower also has the same issue. However, you needn’t fret, because you can find curtains in a variety of uncommon sizes – all you have to do is patiently search for them. Retailers often carry curtains as large as 72×84 inches or 78×78 inches, while some designer curtains could be as wide as 108 inches. The options might be slightly limited, but with a bit of patience you will surely find an extra long shower curtain that blends in well with the color scheme of your bathroom. Don’t skimp on shower curtain length even if it costs extra! If you are uncertain of whether your tub or curtain is a standard size, you can measure this easily. Generally, shower curtains for a bathtub shower are designed to fit a standard 60-inch-long tub. This design includes an additional 12 inches of width for a full appearance and generous folds when pulled shut. As mentioned, the average shower curtain length or height should be such that it shouldn’t pool or drape on the floor. This particular look suits window curtains, but it isn’t ideal for showers as it encourages growth of mildew and mold. To identify the apt place to hang your curtain, measure from the curtain rings if you are using them or from the bottom of curtain rod to the floor. Subtract up to 10-12 inches for a tub to see where to hang your curtains. If you want shower curtains that are swept to the side using tie-backs, please bear in mind they will appear shorter when the material is gathered up. If possible, hang the rod 1 to 2 inches lower to keep the draped curtain outside the rim of the tub. Now that you know about purchasing curtains for a bathtub, it is time to consider dimensions for a shower stall as it will be different. When it comes to shower stalls, you have to find a narrower curtain in the range of 36 to 54 inches. If the shower is large, the curtain has to be wider than 72 inches. Many retailers carry curtains up to 78 inches too. The length of the shower curtain needs to be long enough to ensure the water is caught and directed inside of the shower curb. Measure from the bottom of the curtain rod or curtain rings to the floor and subtract 2 inches. If you have a steady grip, you can make adjustments to a curtain. All you need are some sharp shears and measuring tape. Measure the width of the shower stall, add 12 inches, and cut the curtain to size. Now that you know about shower curtain lengths standard, focus on getting the right ones for your bathroom!